back in berlin, we had a weekly delivery vegetables in a basket. i’ve always liked the concept and it made sense when we lived there… but around here, with a market brimming with fresh stuff practically around the corner (including bio produce), i can’t really justify the indulgence. that said, i do miss one of the aspects that i liked the most about the basket, which was that it removed the choice element, forcing us to improvise and try new things. fish is one of those things that took some time to acclimatise once we moved here. we knew we wanted to try eating more of it (hence #54 on the list) and the market is filled with fresh stuff, but frankly, for a beginner, it’s more than a little daunting to pick and choose what to try… so why not leave that choice to the local fishermen and go with whatever they catch that day? i’m a fan of the throw-yourself-to-the-deep-end approach sometimes. and this is how we now we have a semi-regular fish basket! :) it comes from fuzeta, a seaside parish of olhão around 15km from here. whatever their group of fishermen catches the day before, it’s delivered in less than 24 hours, gutted, sealed in vacuum and covered in ice — and that’s what we’re having throughout the week. we’ve only had a couple of deliveries so far, but it has been working brilliantly, and the feeling of supporting the local community on their traditional trades is a great one. plus, we’ve also been trying quite a few new species with yummy results. 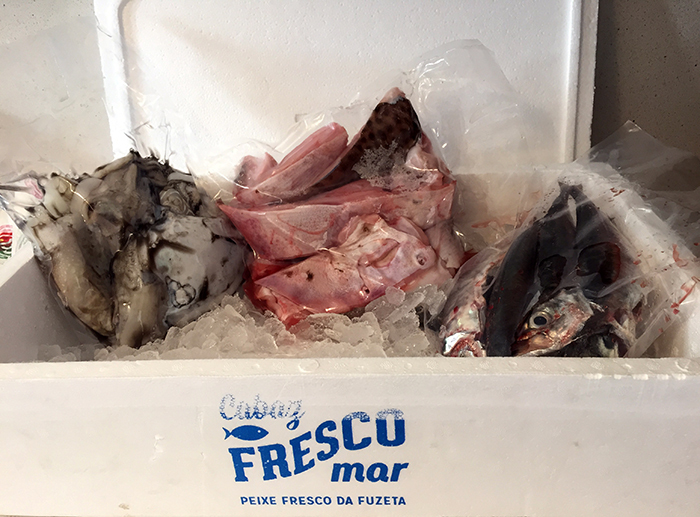 this week: cuttlefish, ray and horse mackerel.